As the President of the French Red Cross Fund, Professor Jean-François Mattei, recalled in his opening speech, our two organisations have common goals, especially that of “building bridges between the operational world on the field and the academic world, between the Anglo-Saxon and Francophone worlds, and […] accompanying ‘humanitarian transition’”. 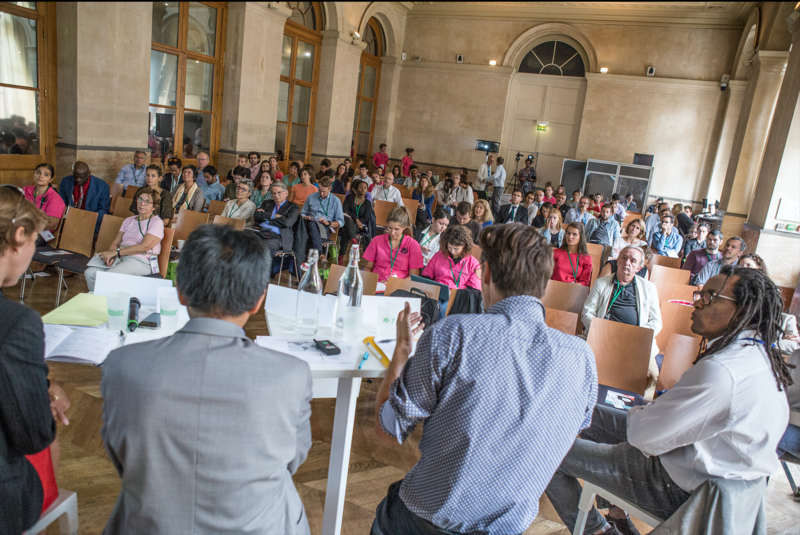 For the second year in a row, Humanitarian Alternatives and the French Red Cross Fund presented “atypical” subjects at Convergences(1)In 2016, Humanitarian Alternatives endeavoured to analyse how humanitarian aid substituted for political weaknesses in the face of forced migrations (to see the full conference, click here) and the French Red Cross Fund organised a conference on insurance against risks of cataclysms and disasters of all kinds (Insurance against the risk of crisis: a path towards humanitarian transition?” To see the full conference, click here).. With this conference, which was held on Tuesday September 5th 2017, we united with the objective of presenting the impacts of climate change on poverty and humanitarian crises. In 2015, on the eve of the COP21 in Paris, a report from the World Bank confirmed the link between climate and poverty, with one of the authors stating that “climate change represents a threat for the eradication of poverty, but its impacts on poverty by 2030 will be determined in large part by political choices: rapid, inclusive development which integrates the risks of climate change may prevent most impacts on the short term, however, 100 million more people may be poor in 2030 because of climate change, if adequate development policies are not adopted”. These projects should foremost concern political and economic actors, but they also raise questions regarding the still-distant relationship between humanitarian, environmental and development NGOs, in the West and in the Global South. Faced with this injunction presented by the climatic agenda, can these three categories of NGOs remain, as we too often observe, confined to their respective fields, or ought they not finally ensure that they work together in field actions, coordinate their partnerships and lead common advocacy initiatives? This debate, which took place as France announced a decrease in development aid and the United States withdrew from the Paris Climate Agreement, was the opportunity to share their observations and proposals. The acceleration and intensification of natural disasters places the question of the impact of climate change at the centre of the debate. We can observe an undeniable increase in temperatures, a heightened frequency of extreme natural events, and a rise in pollution levels which threaten to become even more harmful than those of the pre-industrial era. All of these factors will indisputably have an impact on the local economies of the most vulnerable countries. These factors all mean that the country is currently under threat. Benoit Hazard believes that in order to face up to the consequences of climate change, the problem must no longer be analysed from the angle of the geosciences, but must focus on human, social and public structures. In the same way, Professor Jeannot Ramiaramanana insisted that climate change must not remain a purely scientific issue but that mankind must be at the centre of concerns. He called for the application of the principle of precaution and of shared, yet differentiated, responsibility, recalling that “we have all – to different degrees – participated in climate change and we must all, at our respective levels, take control of the responsibility according to our capacity for action”. Today, “the issue is no longer that of pointing the finger at those who are most responsible, but taking into account the needs of each community”, and respecting the principles of justice, equality and solidarity. At the international level, the USA’s withdrawal from the Paris Agreement and the unfinished discussions regarding the reduction of greenhouse gas emissions reveal a lack of international mobilisation and coherence in the face of this problem, which must be considered to be global. According to Professor Jeannot Ramiaramanana, it is necessary to favour an approach based on the means at the disposal of the international community in order to confront climate change. Scientists are bound by their “duty to the truth”, and aid actors by the implementation of ethical principles and the taking into account of each party’s needs and capacities to reduce the effects of climate change. Oxfam is a confederation of 20 affiliates working in 90 countries. Oxfam’s mission is to combat the inequalities which exacerbate poverty, with the goal of eradicating it. At Oxfam, the question of climate change is seen from the angle of poverty, and more specifically, of food security, and is based on the observation that climate change provokes natural disasters which will have an impact on crops and farming and therefore on food production. According to the association’s estimates, the average price of food with increase by 140% by 2030, and this increase will directly affect the most vulnerable populations. By 2050, more than 20% of the population will suffer from food scarcity. In the field, Oxfam acts on the total system of food and water supplies, and on issues of sanitation. The association also provides food assistance, shelter and emergency kits. Oxfam works with concerned populations on different issues such as the creation of grain stocks, the revitalisation of mangroves – which enable the development of biodiversity and, in case of typhoons, hold back water -, early warning systems, the reinforcement of resilience capacities, risk prevention, etc. In France, Oxfam carries out important advocacy work by publishing reports, raising awareness amongst the general public, and calling for mobilisation in order to influence decision-makers and demand ambitious policy commitments. To learn more about Oxfam’s actions, click here. Moreover, Claire Fehrenbach recalls the creation, in 2009, of the Green Climate Fund, during the Copenhagen Summit, wherein countries agreed to engage 100 billion dollars by 2020, a part of which was to be hosted by the Green Fund, making it the primary channel for “climate funding”. Yet the Fund collected only 10 billion between 2015 and 2018, out of the 100 billion that were initially pledged. A question which is becoming increasingly important to answer concerns the link between climate change, conflict and forced displacement. Cheikh Kane, from the Climate Centre, points out that this question must be clearly addressed and systematically taken into account by states. He reminds us that forced migrations due to the impacts of climate change fall into a legal vacuum, since there is no status for “climate refugees”. Hence, in this context, the Climate Centre is committed to this question and is endeavouring to replace it at the centre of the debate by appealing to international humanitarian law. Cheikh Kane points out that climate change exacerbates conflicts around natural resources, which forces populations to migrate. However, unlike the refugee status, the difficulty of this potential status lies in the identification of the source of the pressure, which gives rise to real limits in terms of responsibility and accountability. The Climate Centre is a specialised reference centre and part of the International Federation of the Red Cross and Red Crescent Societies, based in the Netherlands. Its mission is to allow the Red Cross and Red Crescent movements, and their partners, to reduce the impacts of climate change and extreme climatic events on the most vulnerable populations. The Centre brings together climate specialists and offers advice and strategic research work. The Centre’s research is based on the knowledge and support of the national societies of the Red Cross and Red Crescent, the IFRC and the ICRC. Moreover, the Centre works with a large network of humanitarian partners and climate specialists. To find out more, you can consult the annual report, available here. Finally, Benoit Hazard mentioned the capacity of local populations, which depend on natural resources, to adapt. Taking the example of East Africa, he recalled their capacity to reconvert and adapt. One of the major challenges according to him is therefore to take into account the consequences of aid programmes, and integrate their capacities and resources for adaptation. In this context, he warned against the destructuring effects which certain programmes can have on social relations and resource management. There is, according to him, an important anthropological reflection to be carried out, which could benefit development practices and humanitarian aid. To see the full conference, click here, and for more videos visit our YouTube channel. 1. ￪ In 2016, Humanitarian Alternatives endeavoured to analyse how humanitarian aid substituted for political weaknesses in the face of forced migrations (to see the full conference, click here) and the French Red Cross Fund organised a conference on insurance against risks of cataclysms and disasters of all kinds (Insurance against the risk of crisis: a path towards humanitarian transition?” To see the full conference, click here). This entry was posted in Conferences (VEN) on 19 October 2017 by Alternatives Humanitaires.